There are only two things that you need to remember when you choose to play video poker games on a mobile device to have the best chances of winning, and that is to opt to play the variant that has the high payout percentage attached to it and to always play each initial hand you have been dealt out perfectly! When you have chosen to play at a mobile casino site that uses Microgaming software you are able to play those games via a downloadable App or you could opt to play the games on offer via a web browser and by doing the latter you are not going to use up any storage space on your mobile device. Both of these two different mobile gaming platforms from Microgaming currently boasts six different single hand video poker game variants and each of them are listed below for you. 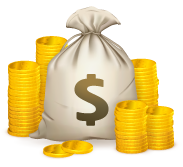 Be aware that in regards to which game is going to offer you the most generous pay table and therefore return the highest payout percentage over the long term then it is the Jacks or Better game you need to be playing. The return to player payout percentage offered by the mobile Jacks or Better video poker game from Microgaming is 99.54%, and to get as near as you can over your long term play to that RTP is going to require you to play maximum coins per hand as by doing so you can be awarded the enhanced 4000 coin jackpot payout whenever a Royal Flush hand is dealt out to you. Playing for anything less than five coins per hand which is the maximum permitted stake amount will reduce the value of the jackpot paying hand combination. You are also going to have to play each base game hand you have been dealt perfectly which is something not all players are going to know how to do due to the huge number of different hand combinations that can be dealt out to you in the initial stage of the game. However the easiest way for you to play this mobile Jacks or Better video poker game perfectly will require you to simply activate the auto hold feature. When you activate the auto hold option when playing this or in fact any of the mobile video poker games listed below, as soon as you have received your five initial cards the game automatically holds for you and locks in place the best cards in that hand. You are then simply tasked with clicking on the dealt button once more and once you do the un-held cards are removed to be replaced with another set of cards drawn out of the deck. So to get the best winning chances when playing at a Microgaming mobile casino if it is video poker games you enjoy playing then opt to play this Jacks or Better variant and also enable to auto hold option when playing five coin hands. 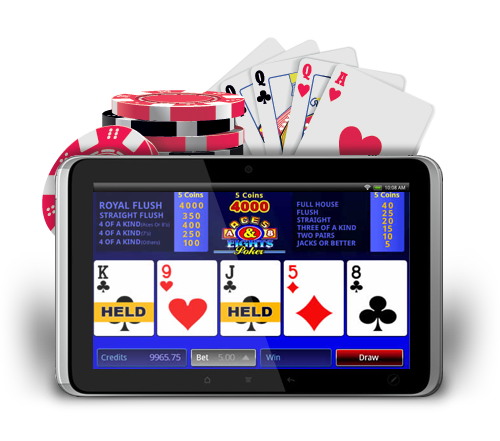 Where Can You Play Mobile Video Poker? In addition to the above Jacks or Better video poker game which you will find offered on Microgaming’s mobile casino App and also on offer via the web browser compatible mobile gaming platform you will find the following five video poker game variants. Be aware though that the pay tables attached to each of the following games return lower payout percentages than that of the Jacks or Better game and as such you should stick to playing that variant as opposed to any of the following due solely to that game offering you the best long term RTP. Aces and Faces – You will find the single hand version of Microgaming Aces and Faces video poker game on offer on their mobile gaming platform, and the pay table attached to this game will see the long term expected payout percentage being 99.26%. This game is in fact their second best paying mobile video poker game variant and what separates it from all other variants is that the pay table has been enhanced in regards to the four of a kind Aces and Picture Card winning hand combinations. Bonus Deuces Wild – The third best paying mobile video poker game from Microgaming is their Bonus Deuces Wild video poker game and this game is unique in as much as there are four wild cards in play in its deck and the games pay table returns an expected long term payout percentage of 99.15%. In case you are wondering it is the 2 valued cards which are the wild cards! Aces and Eights – Another mobile video poker game readily available at any Microgaming powered mobile casino site is the Aces and Eights game, this games pay table will be expected to return to payers over the long term an RTP of some 99.09%, and much like all other variants the pay table has been changed slightly to take into account some enhanced winning payouts associated with the Ace and Eight hand combinations. Double-Double Bonus Poker – As we move down this listing of Microgaming’s mobile video poker game variants you will notice the expected long term payout percentage each additional game offers are getting lower, and this is certainly the case on the Double-Double Bonus poker game. Whilst the name of this video poker variant may sound appealing its long term expected RTP is not and as such when playing this game optimally you will be playing a variant offering a payout percentage of just 98.98%! Deuces Wild – If you enjoy playing video poker games which come with a set of wild cards then we would advise you to play the above Bonus Deuces Wild video poker variant as opposed to the standard Deuces Wild variant when logged into any Microgaming powered mobile casino site, and the reason for us advising you to do that is that this particular variants pay table is a very poor paying one and as such returns an optimal play expected long term RTP of just 96.76%!